Posted on Friday, December 20th, 2013 at 9:08 am by Pieter van der Westhuizen. Microsoft Outlook produces and uses a variety of file types. The most common and well known fields are either .pst or .ost files. These two file types are known as Outlook Data Files, the .pst file is known as the Personal Outlook Data file and stores you messages and other Outlook items. PST files are commonly used for either POP3 or IMAP accounts whereas .ost or Offline Outlook Data Files are used when connecting Outlook to a Microsoft Exchange Server account. Adding a .pst file to Outlook is easily done using the AddStore method of the Outlook Namespace object. Removing the store takes some more work, because the Namespace object’s RemoveStore method expects an Outlook Folder object as parameter. In the following code, we create a new Outlook Store, add it to Outlook and then remove it again. Removing it, does not physically delete the .pst file from the file system. The easiest way to create an .msg file is to use the Outlook COM interop assemblies or by creating an add-in using Add-in Express. We’ll look at the last mentioned option. 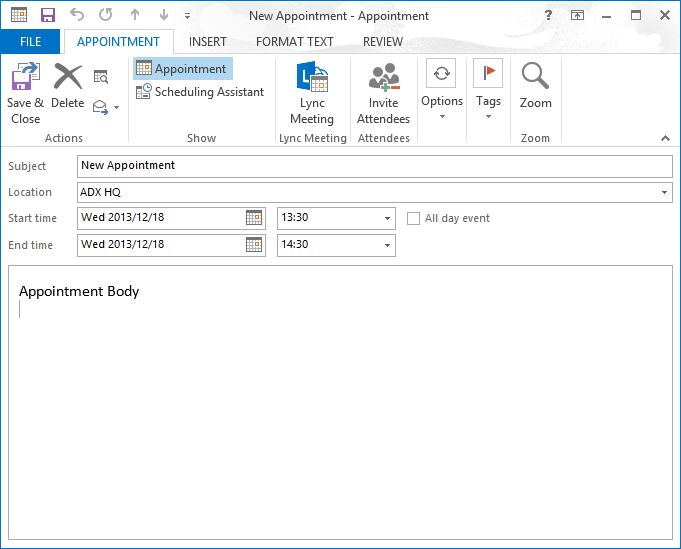 After creating a new ADX COM Add-in and finishing the New Microsoft Office COM Add-in project wizard, open the AddinModule design surface and add a new ADXRibbonTab component to it. The code above will create a new Outlook mail message and save it as an .msg file. The above code will use the OpenSharedItem method of the Namespace object to load the .msg file and display it. When clicking the button it should show the saved e-mail message. 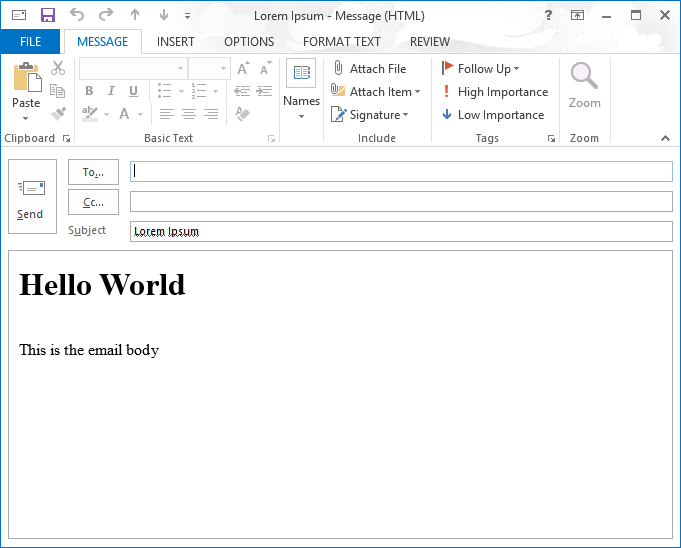 Creating an .ics file using the Outlook object model is similar to creating an .msg file. We’ll add two additional buttons to the ribbon tab created previously. The above code works in a similar fashion as creating an .msg file. You will notice that we passed an additional parameter to the SaveAs method that specified the type of file we’re saving. Using C# you would only need to create a simple flat text file and save the contact information in the above mentioned format. Reading a vCard file can also be achieved by simply reading the text file line-by-line and parsing the data or you can use the open source class available on CodeProject. Nice article! !Is it possible to convert an ics(icalendar format) file to a DataSet in c#? It should not be too difficult to accomplish. Have a look at this StackOverflow question discussing parsers for ics files. Hello, about the .msg file extension, is it possible to add custom properties to it? If I add custom properties to a MailItem instance, save it in msg format, get back a MailItem instance from the .msg file and than go to read its custom properties all values are NULL!!! Unfortunately, it is not possible to do that. I was wondering if it is possible to check what type of data file is set by default. On new account I’ve noticed that the extension is OST but if I a datafile is it created as PST, is there a way to know if Outlook is using an OST or PST file? See the Store.ExchangeStoreType property; https://docs.microsoft.com/en-us/office/vba/api/outlook.store.exchangestoretype. Also, you may want to use Store.IsDataFileStore and, probable Store.IsCachedExchange.